Until recently she was but a rusted ruin, pieces of iron exposed in the shifting sand and muck that once buried the hull at Ocean Shores, Washington. 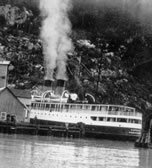 Older folks in the area remembered her as the S. S. Catala, a small 229-foot coastal steamer that once carried freight and passengers from Vancouver, British Columbia, to southeast Alaska for the Union Steamship Co. Built in Glasgow, Scotland in 1925, the vessel spent its life on the Canadian coast until 1958 when it was sold to new owners and used for a time as a fish buying ship. When the World’s Fair came to Seattle, the vessel was refurbished as a floating hotel and moved to the Seattle waterfront in 1962. The engines were removed to make room for a theater. When the World’s Fair was over, the vessel was towed California and used as a floating restaurant. In 1963 the floating hull was brought north again to Damon Point State Park at Ocean Shores, moored at a causeway, and used as a floating “boatel” for charter fishermen. The vessel offered 52 staterooms, a restaurant and lounge. Electricity and telephone service was extended to the ship and a bridge and roadway provided easy access to a parking lot near her bow. It was a good operation for everybody involved until the day of the big storm. On New Year’s Day 1965, a gale packing 70 mile-an-hour winds and high seas out of the southwest, coupled with an unusually high tide pounded the shoreline. Yards of sand were swept from under the Catala’s starboard side, leaving the vessel grounded and tilted at an extreme angle to starboard. The owners could not refloat the hull so it became a derelict. The owners salvaged all they could from the wreck. Thieves sacked the wreck, and vandals set it on fire. People climbed on it, partied on it, and wrote on it, local residents recall. Then, after a young woman hurt herself on the wreck, there was a lawsuit. After that wreckers came to cut as much of the wreck apart as possible and haul it away. But a lot of the old ship was by then buried under the sand. After a few years it was so completely covered that no trace of the Catala was seen. In recent years, however, nature reversed what it did to the Catala. 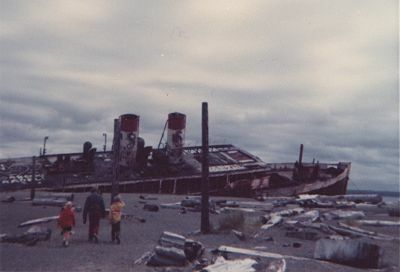 The remains of the wreck began reappearing more each year as the sands were shifted by wind and waves. Then in April, 2006, someone poked a stick in an opening in the hull and discovered an oily sludge inside. The Washington Department of Ecology and other natural resource agencies took action to prevent a chance of an oil spill from the wreck. The remains of the old hull were completely removed from the site.